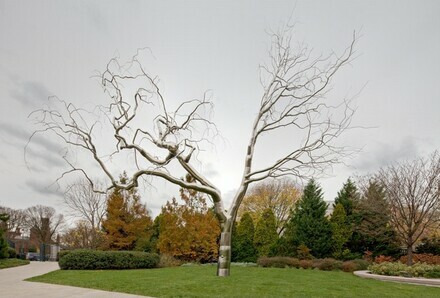 At first glance, this sculpture's composition of trunk and branches, and its scale, relate Graft to mature trees in the garden. Yet the differences outweigh the similarities, starting with its shiny, stainless steel exterior. One set of branches appears orderly and rational in its progression upward, while the other set exhibits crabbed, twisted, and fraught boughs. The work's title refers to the horticultural procedure of joining one tree or plant to the bud, stem, or root of another in order to repair it, adapt it to climate or soil change, propagate it, or produce new fruits or flowers. The conjoining of two distinct sides in Graft may also be seen to connect the binary historical tropes in the history of art—classical on the one hand, and romantic on the other. Another definition of "graft" refers to the means by which an individual or entity gains power unfairly. This sculpture is part of a series of stainless steel sculptures the artist refers to as "Dendroids," a term that describes a tree-like, branching form, but also evokes an artificially engineered or mutant body. Graft was added to the Garden on the 10th anniversary of its opening. Commissioned 2008 by NGA; installed October/November 2009 in the NGA Sculpture Garden. Donovan, Molly. "Roxy Paine, Graft." Bulletin / National Gallery of Art, no. 42 (Spring 2010): 16-18, repro.